I'm sure you will love it too. But first, you will have to find out where the boat stations are, right? Don't worry, I'll show them to you in a map and here is a link to the company that operates the boats (Transtejo) in order for you to know the updated schedulles and charges of each boat ride. 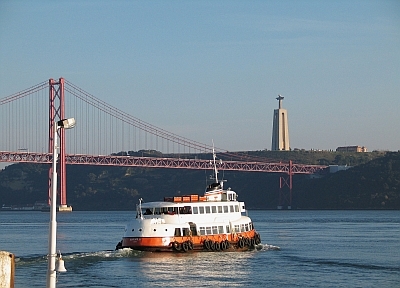 There are three main boat stations in the Lisbon side of the river - Belém, Cais do Sodré and Terreiro do Paço - and five in the other side (south side to be more precise) - Trafaria, Cacilhas, Barreiro, Montijo and Seixal. With the precious help of Google Maps, I buid a map of the boat stations in Lisbon. Please, navigate through the map or watch the locations marked on the satellite view and get familiar with the boat stations.